Footpaths have no use on this road, courtesy clueless cops and unhelpful BBMP! Traffic police say BBMP needs to clear the encroachment. 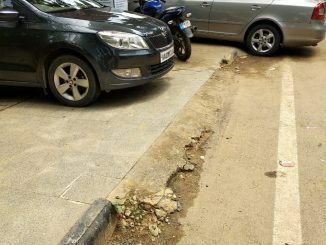 BBMP is still clueless on how to clear the encroachment, as the road lies on the boundaries of two wards and two assembly constituencies. Public policy is a sunrise area in the field of education. And here is a course for women interested in public policy. Good road, clean water, waste disposal: Corporator ensures it all, not the PM! While we’re busy talking about national politics, the problems we face in daily life are local in nature: The garbage, the potholes, bad roads, power, water – everything. 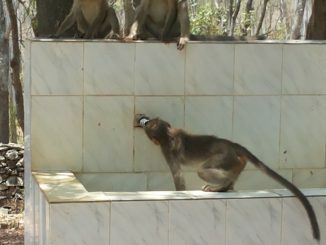 Right to water bill: Will it increase water supply in Bangalore? Bangalore draws its water from Cauvery, 90 km away and 500 metres below the city. Groundwater is depleted beyond limits. How will Right to water bill address the inadequate supply? How many Bangaloreans wandering around the city have wondered about some many ‘hallis’ abound here? Here’s your primer on the villages of Karnataka. 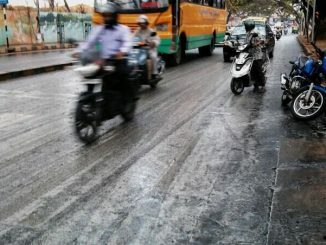 Why is it cloudy and raining in Bangalore – now? In the last 50 years, it has rarely rained in the months of February and March. But Pavan Srinath finds interesting data that proves the adage, ‘When it rains, it pours!’. 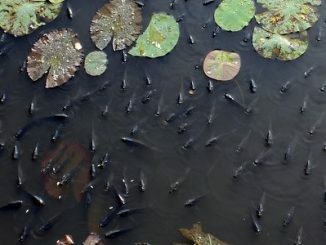 Large numbers of fish have been found gasping for air in Lalbagh’s lotus pond, occupying all open surfaces of water. Suffering from a lack of availability of dissolved oxygen, it is unclear as to how much longer they can survive, if no action is taken.